In 1947 almost six million tons of coal were produced by the 32 pits and collieries in Fife. Almost 20,000 worked in the industry. Integral to the effort were 57 steam locomotives, many of which are seen at work in this selection of photos from the 1960s and 1970s. Tom's text is rich and detailed and the photographs crisp enough to walk into. 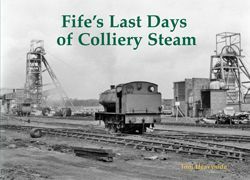 The book contains special sections on the Fife Coal Company and the Wemyss Private Railway. Collieries and pits featured include Comrie, Frances, Blairhall, Valleyfield, Cowdenbeath, Nellie, Glencraig, Mary, Minto, Bowhill, Kinglassie, Rothes and the Wellesley.